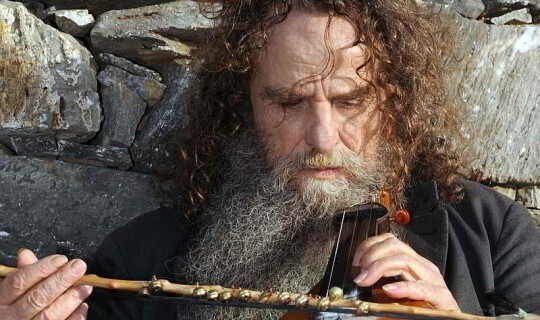 Adonis Xylouris, aka Psarandonis, comes from a renowned Cretan musical family and is known as the most idiosyncratic lyra player on the island. An exponent of tripped out Cretan music, Psarandonis’ unique three-stringed lyra playing style, his distinctive voice and his inimitable rendition of traditional folk songs has made him a cult legend in Greece and beyond, particularly with a younger generation of Cretan music lovers. Seeing Psarandonis live is considered to be a once in a lifetime experience. In January 2009, Psarandonis gave memorable performances at the All Tomorrow’s Parties Festival curated by Nick Cave & The Bad Seeds and hosted on Cockatoo Island, Sydney and Mt Buller in Victoria. George Xlyouris and Jim White will again join the master lyra player as they weave a way into your skull with shows in Sydney, Melbourne and Castlemaine in addition to the already announced performances at Womadelaide and at Meredith's Golden Plains Festival. Don't miss Psarandonis live this March.